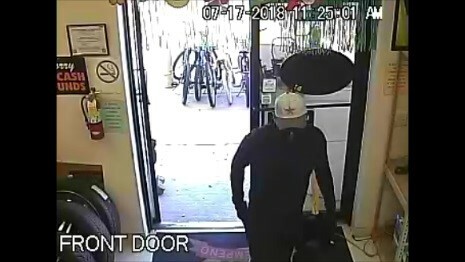 Laredo, Texas – The Bureau of Alcohol, Tobacco, Firearms and Explosives and the National Shooting Sports Foundation (NSSF), the trade association for the firearms industry have announced a reward of up to $10,000 for information leading to the arrest of the suspect responsible for robbing El Bufalo Pawn, located at 4515 US Hwy 83, Laredo, Texas 78046. A Hispanic male entered El Bufalo Pawn on July 17 at 11:25 a.m., while the store was open. 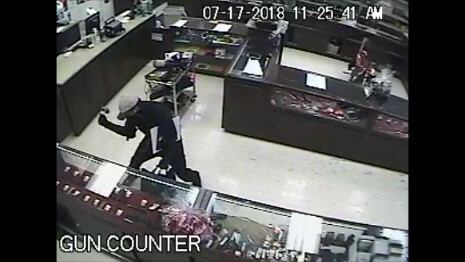 The suspect began smashing display cases with a hammer and stole 4 handguns. The suspect is described as a 5’10”, medium to heavy build, wearing black clothing, a gray Dallas Cowboys hat with a blue star, sunglasses, and a bandana tied around his face. “ATF is working with all of our partners to recover these firearms quickly and apprehend those responsible,” said ATF Houston Field Division Special Agent in Charge Fred Milanowski.